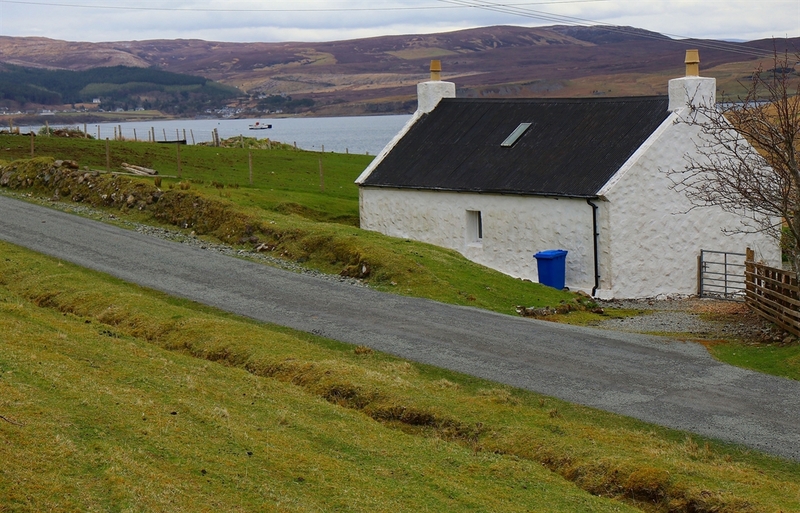 Taigh Alasdair is a traditional stone croft house in Peinchorran in the Braes area of Skye. It sits in its own secluded and mature garden with stunning views of Loch Sligachan, the Red and Black Cuillins and Raasay. The cottage has been divided into 2 main rooms with an adjoining hall. Original features of the house have been retained as much as possible. The main living space is an L-shaped sitting room with kitchen/dining area. The sitting room has a wood burning stove set into a stone fireplace. There is an electric heater, if required. The sofa turns into a comfy double bed. The kitchen is a mix of traditional and modern with a Belfast sink and brass taps complemented by an electric cooker, fridge, microwave, toaster and kettle. There is a washing machine which is situated in the porch. There is 1 bedroom with a king sized double bed. The view from the bedroom is of the garden. The bedroom has an electric heater. All the linen is provided, but we do ask you to bring your own towels. There is a bathroom with toilet off the porch. The fenced garden is secluded. Peinchorran is a very quiet spot which makes the garden perfect for relaxing. Garden furniture is provided. There is off road parking. Electricty - We read the meter at the start and end of your stay and charge you the standard rate - currently 15p a unit. If you would like a bag of logs, then let us know and we can arrange that for you. Pets are welcome. We do request that the garden area is kept clean and that the normal countryside code is adhered to most especially at lambing time. Smokers are requested to smoke outside. Bookings are Saturday to Saturday at £400 per week.